Commentaries are conversation partners. They are not gurus who must be silently listened to and obeyed. They are not an equal panel of experts who deserve equal time at the microphone. And they are certainly not fools to be left unheard. They are conversation partners. Conversation partners can be so valuable, but its worth picking them wisely. Conversation partners can be so helpful, but conversation requires both sides to speak. Thus it is important that we engage the text first in order to have an opinion to bring to the conversation. Then, when we get there, we can interact with the others at the table. Some of them we’ll find stimulating and helpful, others we might find inconsistent or agenda driven. We may tune some out. We may listen at length to others. But the key is conversation. Now a conversation with Douglas Moo, Thomas Schreiner, James Dunn and Leon Morris – that would be worth having! Let’s bring in Cranfield, Murray and Calvin for good measure. This is the table to sit at in the biblical studies conference dining hall! 1. If you can, try before you buy (library, google books, friend, etc.) If not, at least get good recommendations (such as on bestcommentaries.com). 2. Let your ministry provoke your purchases. 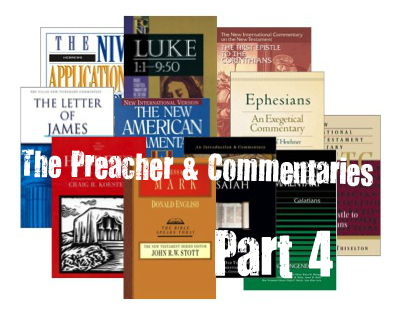 I take a sermon series as a good excuse to buy a commentary or two if my library is lacking in that area. 2nd Chronicles now, Acts next. 3. Build a quality library slowly, rather than a junk collection fast. The personal library is a vital tool of the preacher. Even if it is only five books, if they are five good books, then it is worth having! Don’t rush, don’t get into debt, and don’t buy books with more hype on the cover than content in the pages. 4. Building an electronic library may save you money, but it may not. Last week we looked at software options – here’s the link.